How does it affect reading? Dyslexia means "trouble with words." Recently, however, it has been further categorized into many different labels including ADD, ADHD, visual-spatial learners, processing disorders, etc. As more is learned about the commonality in thinking styles among all of these, there is a consistent theme with respect to many learning disabilities: Disorientation. Disorientation affects many areas of learning such as reading, spelling, comprehension, writing, and math. Severity of disorientation will vary depending upon the person and situation. It can cause a dyslexic to perceive that the words are "hovering" or even sliding off of the page. It can cause words to appear or disappear (addition or omission of words in the text). Bottom-line: Disorientation prevents the information from being perceived accurately. 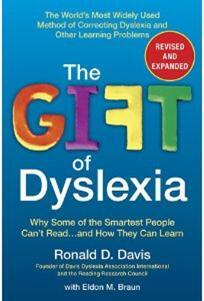 Read more about how Davis Orientation Counseling® provides tools for correcting perception in Ron Davis' breakthrough book, The Gift of Dyslexia. Available in paperback, eBook, and Audible versions! How does the Davis Program help with disorientation? The Davis® program is unique because it addresses (and corrects) the distorted perception experienced by Dyslexics when dealing with the written word by using simple, but highly effective, mental techniques and allow for a relaxed, alert, and focused physical and mental state while reading. Brilliant! With his discovery of turning off disorientation, Ron Davis went on to develop The Reading Research Council in California with the help of Dr. Fatima Ali, Ph.D. Together, they worked with hundreds of Dyslexic volunteers - explaining how they, too, could recognize and turn off their own disorientation. Consistently, they all experienced corrected perception by following his instructions. When word of mouth spread about the Davis methods, and Ron found himself in a position where he could no longer keep up with the demand, he published The Gift of Dyslexia and established Davis Dyslexia Association International where facilitators are now trained. How do other reading programs help with disorientation? Sadly, they don't! If you have tried other programs and experienced limited success, it is likely because disorientation was not addressed. It is critical to get disorientation under control in order to truly learn and, ultimately, to correct dyslexia. Learn how to control disorientation! Contact us TODAY!